There was a time when the borders of Poland stretched from the Baltic coast as far as the Dnieper river, following its sinuous curves all the way to the Crimean peninsula. In those Golden Times the country, or the Polish-Lithuanian Commonwealth as it was known, was one of the largest countries in Europe, and a mighty force to be reckoned with. It embraced a multi-cultural society of Poles, Lithuanians and Ruthenians, defended itself from oppressive invaders, and enjoyed economic prosperity thanks to its exploitation of serfs and peasants. It fostered arts and sciences, maintained a diplomatic neutrality and led to the first constitution in Europe. All in all, it was a generally wonderful place to be. But there was one problem on it's eastern border, one trouble that couldn't be quelled. Cossacks. Cossacks are a noble warrior tribe, a militarised group of Slavs who don't recognise any authority than their own. Fearsome on horseback and worthy seamen, they proved to be willing mercenaries for any number of East European nations through the ages, and piratical raiders when unemployed. Politically, they fell under the control of the Commonwealth, but little could be done to reign in their terror, especially their attacks on the Ottoman Empire. They would plunder and ravage at whim, always to return to their fortress settlement of Zaporizhia, by the rapids of the river Dnieper. Officially, they were registered and employed as a battalion of elite soldiers, but by the middle of the 17th century those Cossacks became a menace, and through a series of revolts and incursions they destabilised the entire Commonwealth and sparked off the Deluge, a string of political and military events that would wipe Poland off the map. For the Cossacks, this was their attempt to be recognised not just as an underclass or military unit, but as a separate nation state, which they called the Zaporizhian Sich. Since those times, Zaporizhia has calmed down somewhat, using its coastal waters to unload shipping cargo rather than captured booty, but the area still maintains a reputation for bucking the trend, for doing things their own way, and that can clearly be seen in the ZAZ-968. Fast forward two hundred years, and the Communists have taken over the region. Desperate to get the Cossacks off their horses and into cars, they converted an agricultural factory into a production facility and set to work on their new project, the Zaporozhets. 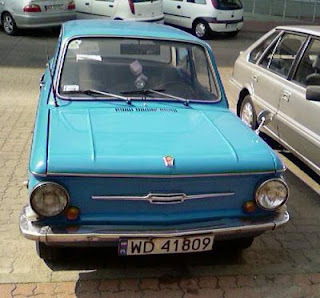 Reminiscent of the Fiat 600, the ZAZ-965 was a hunchbacked little lump with many similar features to its Italian doppelganger, most notably the rear-mounted engine. It wasn't exactly a technical revolution, which is no surprise since it came from the far more mundane Moskvitch design office. But the Cossack engineers had more ambitious plans, and from their design centre in Melitopol they created a unique engine for the pint-sized car. The MeMZ V4 750cc engine was unlike anything else in the Soviet automotive arsenal, and its compact structure perfectly suited the tiny engine bay at the back of the ZAZ. It wasn't powerful, but it was air-cooled, and that made significant savings on complexity as well as weight, and allowed the miniscule ZAZ to roll off into the Great Meadows with a herd of 27hp. The little ZAZ showed that the principle of a Ukranian People's Car was certainly achievable, and the factory worked hard to expand its options. In 1966 it unveiled a bigger saloon platform, the ZAZ-966, which bore an uncanny resemblance to another air-cooled Sixties saloon, the German NSU Prinz. But the Ukrainians couldn't leave it like that. The Cossack attack is fast and light, quick strikes, and even though the 966 wasn't a big car, it's engine needed a lot more power than 750cc could deliver. So MeMZ enlarged it, making it first 900cc and then 1.2litres, gave it an ever-so-slightly different nose, and called it a ZAZ-968. Released in 1971, this was the car that everyone knew simply as the Zaporozhets, and many alive now still remember the glorious times when their grandfathers owned one of these distinctive machines. Those rear vents quickly earned the car the nick-name "Uszy", or Ears, and they were responsible for sucking the air into that rear-mounted engine, and it's those little quirks that have earned the car such a loved-and-laughed-at reputation. Because the car was designed to be the ultimate People's Car, simplicity was the byword of design, making the car as ergonomic as possible to fit into the peasant lifestyle of the Ukrainians, and the Soviet Union as a whole. Internal heating was provided by a separate petrol burner with its own tank, so that the engine didn't need to be run to keep the cabin warm. The wheel rims mounted directly to the brake drum, with bolts around the edge, to save on weight and metal. And by making the car was so light, the little engine needed to be revved hard, so the gearbox gate was redesigned with first gear standing out on its own, down and to the right. That way, it would be much easier to shift between second and third gear when negotiating the potted Soviet roads. Handling could be improved by filling the front cargo bay with rocks. The car was a peasant uprising of a machine. There were never enough cars to satisfy the needs of the Soviet Union, but the ZAZ became the icon of underclass motoring, with its simple design making it perfect for invalid carriage conversions. Its basic setup could be adjusted for those who had lost a limb or two in battle, with both the accelerator and brake hand-operable. And with such a reduced design, it carried the ultimate weapon; price. The Zaporozhets was such a cheap car that, when exported, it still cost less than the Skoda 105 or the Fiat 126, and workers up and down the country were desperate to get their hands on one. This would never be a status symbol like the big GAZ Volga sedans, but it quickly became a cultural icon, and even contemporary owners of the cars, thirty years afterwards, claim their ownership with pride rather than embarrassment. The general public have more ambivalent feelings towards the car, but most people have at least one story to regale of the time they encountered the strange machine from Zaporizhia. However, like the Cossacks, it's great to talk about the ZAZ, but the idea of having to rely on it instils us with fear. Like their ancestors, the Zaporozhets had a reputation for unreliability, and you never knew when it would turn around and leave you stranded and unsupported, or worse. 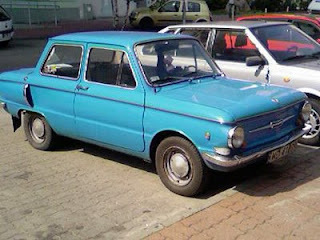 For that reason, the ZAZ has left behind a cultural legacy of both scorn and admiration. All of the criticisms, such as a lack of power or poor build quality, are exactly the things that endear the car to its owner, in much the same way as other People's Cars like the Trabant or the Syrena. And just like those two, the more Zaphorozhets tried to improve the car, the less likeable it became. In 1980, power was increased by the clever men at MeMZ, who managed to squeeze 50hp out of the already gasping engine, but at the cost of those distinctive ears that give the ZAZ-968 its charm, and the 968M was a poor replacement. The looting days of the Zaporizhian invader have long since ended. Just as Zaphorizhia was flooded by the Kakhovka Dam, inundating the Great Meadow with a deluge of its own, so too did air-cooled engines fall out of favour against the unstoppable tide of water-cooled engines. By 1994, the ZAZ-968M was a dusty relic of the late Sixties, and no amount of gimmicks and cheapness could prolong its execution. As it bowed out, its shoes were filled by the smaller, and also-but-slightly-less outdated ZAZ Tavria. And with its demise, a worthy enemy, or charismatic ally, passed into legend. Working primarily as an English Language Specialist, Richard devotes far too much of his spare time poking around the decaying fragments of Warsaw, that unloved and abused mishmash of Communist industrialism and new Western Capitalism. 2009 Design by Free CSS Templates | Blogger Templates by TeknoMobi | Drupal .